While eating garlic might leave your breath smelling a little stinky, studies have shown how it can also help protect the body from developing cancer. According to a new report published in The Daily Telegraph, eating raw garlic twice a week could reduce your chances of developing lung cancer by nearly 50 percent. This cancer clinical study (also available online in Cancer Prevention Research), has identified an association between consuming raw garlic and a lowered risk for lung cancer, even among people who smoke regularly. 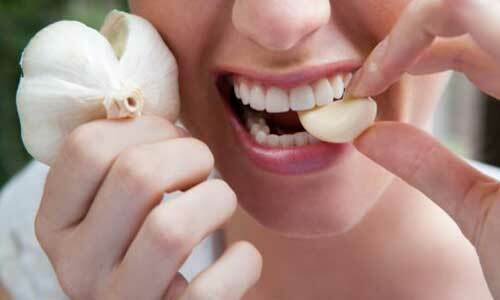 At this time, scientists are not sure whether the same benefits can be gained from eating cooked garlic. While garlic is used in a lot of popular dishes, there are not as many people who prefer their garlic raw. Scientists from the Jiangsu Provincial Centre for Disease Control and Prevention in China examined 4,500 people who were in good health and another 1,424 people who had been diagnosed with lung cancer. They soon found that adults who consumed raw garlic at least two times each per week had a significantly lower risk of developing lung cancer. According to their analysis, these adults risk for lung cancer was as much as 44 percent less than those that did not eat garlic. Even more incredible was the fact that raw garlic seemed to have a similar benefit for adults who smoked. For years, garlic has been touted as a wonder herb, with claims that it can help fight off stomach problems and even prevent colon cancer. There was a reason that garlic is one of the items that could fend of vampires. But what makes garlic so healthy? Well, scientist believe that this is because of a chemical called allicin. What can Allicin Do for You? There are a wide range of health benefits that can come from allicin. Aside from helping protect the body from cancer, studies have shown that allicin can help enhance the immune system, lower bad cholesterol, and increase good cholesterol. This chemical can also be beneficial in preventing cardiovascular disease or other heart-related complications by improving the overall health of the circulatory system. Currently, lung cancer is the most common type of cancer diagnosed in both men and women in the United States. Studies like these are very important, as it lends further support for the prevention of cancer through healthier eating habits. Each year, more people die from lung cancer than from colon, breast, and prostate cancer combined. If you never eat garlic, this may be something worth experimenting with. Another big implication from this lung cancer clinical study is that the benefits seem to be extended to people who smoke. Smoking is the leading cause of lung cancer, and the Lung Cancer Alliance urges all smokers to consider quitting. This is as much for the smoker’s benefit as it for their families, since research suggests that long-term second-hand smoke exposure could also trigger lung cancer. In addition to garlic, the Lung Cancer Alliance recommends a diet with plenty of fruits and vegetables (especially things like cabbage and broccoli). If you are planning on purchasing some garlic during your next trip to the grocery store, please remember that you don’t have to overdo it. They have released health reports in the past, and you shouldn’t be consuming more than a clove or two of raw garlic per day. Try sticking to two cloves on a weekly basis, and you should be on the right track.